Camborne is one of around only 500 Fairtrade Towns in the World and stands beside Falmouth that is the only other Fairtrade Town in Cornwall. We are also within the Fairtrade Diocese of Truro and the Fairtrade Methodist Fellowship of Cornwall. 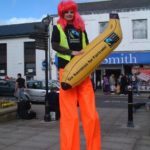 To become a Fairtrade Town we first needed the backing of the Town Council which passed a resolution supporting Fairtrade in 2011. Camborne Council has supported Fairtrade ever since and has gone on to win an award for running a Fairtrade Office. Churches Together in the Town fully supports Fairtrade as does Camborne Regeneration Forum, BID Camborne, and a number of retail businesses, hotels and cafes. We achieved Fairtrade Town status in 2011 and successfully renewed a year later. We have then renewed the status every two years. We are now starting our 6th year as a Fairtrade Town. A number of businesses have received South West Fairtrade Business Awards along the way. St. John’s RC Primary School is particularly worthy of note as they have reached the highest level of Fairtrade School – ‘Fairtrade Achiever’. To be a Fairtrade retailer all you need to do is sell a minimum of 5 things which are Fairtrade. This can be anything from craft items, through clothes to food, including sweets. A Fairtrade office would offer Fairtrade refreshments to its staff/clients e.g. tea, coffee and sugar. A Fairtrade restaurant needs to serve a minimum of three Fairtrade items, usually tea, coffee, sugar and hot chocolate. If you want to be listed as a Fairtrade Camborne supporter, and your business/organisation meets the criteria, then email Brian Terry (Fairtrade Co-ordinator) at goterrrydev@aol.com.